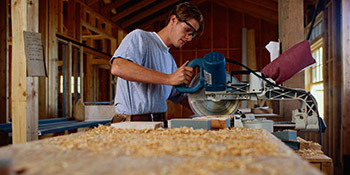 Carpenters and joiners are skilled craftsmen responsible for constructing buildings, furniture and other objects. Carpenters work primarily with timber and their role requires plenty of manual labour. Skills are picked up over the years through both experience and study and they’re used by homeowners, businesses, schools, farms and more, for a number of reasons. Joiners also work in the wood construction industry and are seen as a type of carpenter, responsible for cutting and fitting wood without the need for nails, screws and metal fasteners. You could require the services of a joiner for many different needs, but they’re mostly associated with interior decorating such as doors, windows, stairs, tables and bookshelves. When would I need a carpenter or joiner? You could be surprised by exactly how much a carpenter or joiner can do for your home and even fixing broken wooden chairs will fall under their expertise. But they also deal with much more complex installations such as extensions. With carpenters and joiners, you’ll be trusting a professional to take care of your home repairs and installations. As a skilled specialist they’ll provide you with the highest quality of work. Carpenters and joiners are primarily associated with wooden constructions and can deal with a number of your home’s key features from the staircase to the windows and doors. If you’re in need of either a carpenter or joiner, just complete our quick form below and hear from the professionals who have been independently vetted. Project: Great, what do you need done? Supply and Installation 8 internal doors. Cheap as possible to supply and hang. Project: I have an alcove measuring w89cm x h239cm x d93cm that I am wanting a fitted wardrobe building into. Looking for some rough quotes of how much this will cost. The below data displays the energy performance of homes in Uk. Energy ratings range from A to G, with A being the most energy efficient and G being the very least efficient. The Energy Performance Certificate (EPC) rating comes into play heavily when attempting to sell your household, as possible buyers will see how much they're likely to be spending on their heating bills. Property upgrades such as insulation help to drastically improve a home's EPC rating. There are several types of home in the United Kingdom and the info below illustrates the type of housing in Uk. Over the country the most popular housing types are typically semi-detached and terraced housing, although detached homes, flats and bungalows are also available. The data underneath gives an indication for the number of properties in Uk which are central heated and non-central heated. Households are heated by a number of sources which indicate how expensive annual energy bills will be. Examples of central heating include gas, electricity, oil, solid fuel and LPG boilers. Changing the way in which your house is heated can see you with cheaper bills. The data underneath reveals the spread of homes warmed by different fuels. Around the United Kingdom the most common by far are gas heated homes, followed by electricity and then oil. Biomass boilers are also growing in popularity, heated by green products like wooden pellets or agricultural waste.|Homes in the UK are warmed by a variety of fuels, including gas, electricity, oil, solid fuel and LPG boilers. Each fuel has a varying cost associated with it which means you can find yourself with less costly energy bills by changing the way your house is heated. Even solar thermal panels are being regarded as by many in order to cut heating bills for the years to come.